A whole host of Dark Shadows releases are on offer this week, plus a brand new collection of stories are available for one of our favourite characters from Collinsport, Quentin Collins. This weekend you can save on the Dark Shadows Audiobooks and the Dark Shadows Full-Cast Dramas range. Save 50% by using the offer code QUENTIN50 (all upper case) at checkout. These Dark Shadows special offers last until 2359 UK time on the 5th March 2018, so don’t miss out. Why not try In the Twinkling of an Eye? Nominated for the 2016 Scribe Awards Best Audio, this release stars Marie Wallace from the original Dark Shadows series. Dress me in Dark Dreams features Buffy star Amber Benson and Terry Crawford in a tale by gothic writer Marty Ross. The House by the Sea stars the Sixth Doctor Colin Baker in a perfect introductory tale to Dark Shadows, written by James Goss. And don’t forget out this year is the return of Quentin Collins to Collinsport in Maggie & Quentin: The Lovers’ Refrain. Out in June 2018, this release brings Quentin Collins, played by David Selby together with Maggie Evans, played by Kathryn Leigh Scott in four new tales by Lila Whelan, Mark Thomas Passmore, Cody Schell and Alan Flanagan. The Lovers' Refrain, available to pre-order now, will be released in June 2018. Pre-order it on CD at £30 or £25 on download. And to celebrate the return of Quentin Collins, now available is a new digital collection of eight Dark Shadows releases featuring Quentin Collins (David Selby). The Quentin Collins Collection contains Dark Shadows tales The Skin Walkers by Scott Handcock, Blood Dance by Stephen Mark Rainey, London's Burning by Joseph Lidster, The Creeping Fog by Simon Guerrier, Operation Victor by Jonathan Morris, The Haunted Refrain by Aaron Lamont, The Darkest Shadow by Nev Fountain and Panic by Roy Gill. You can get these eight tales together at the very special introductory price of £30 this weekend. 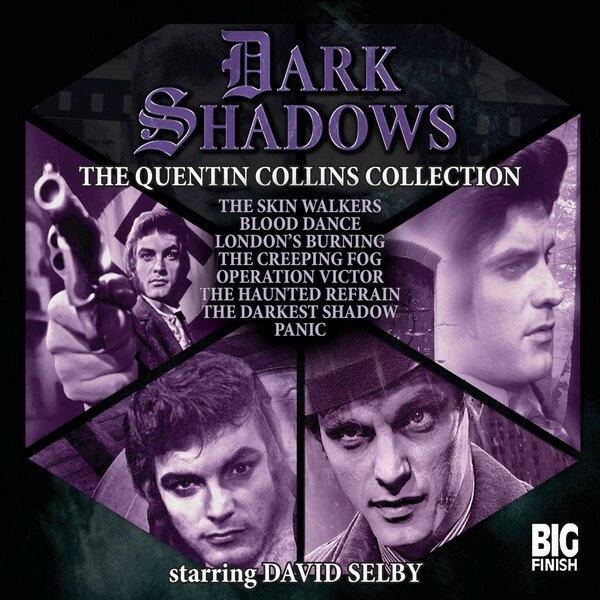 Please note the Quentin Collins Collection isn’t included in the Dark Shadows offers, and the normal price for this download-only release will be £40 after 2359 UK time the 5th March. Save on the Dark Shadows Audiobooks and the Dark Shadows Full-Cast Dramas range. Save 50% with the offer code QUENTIN50 (all upper case) entered at checkout. These Dark Shadows special offers last until 2359 UK time on the 5th March 2018, so don’t miss out.